Your cryptocurrency friendly current account. As part of our business model and token distribution model we have introduced a user-growth token linked burning. 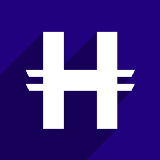 HBRS token burning event will happen every quarter for the next foreseeable future until the company decides to stop quarterly burning.